South Coast Hauling & Bobcat is a full-service underground utility contractor that is well qualified to provide expert electrical, sewer, and water line repairs, replacements, and installations/tie-ins throughout Orange County. With over three decades of experience, a Class A General Engineering license, and two Class C licenses for earthwork, paving and demolition, we're able to handle a wide range of underground utility work from start to finish. We work directly with general contractors as well as residential and commercial clients, and have thousands of satisfied customers throughout San Clemente, Dana Point, San Juan Capistrano, Laguna Niguel, Mission Viejo, Lake Forest, and surrounding areas. Anytime that we have a construction project that involves underground utility repair, relocation, replacement, or installation, we fully evaluate the site and scope of the work in order to create a comprehensive plan that will ensure that everything proceeds smoothly and safely. With our Class A license, we're allowed to work on residential and commercial jobs that need to cross over into public or city property, and can handle all required permits. When working on underground utilities that need to connect to main city lines, our scope of work typically includes saw cutting the street, removing the asphalt (either by hand or machine, depending on the type of utilities involved), installing or repairing the utility line(s), and then backfilling, compacting, and paving asphalt according to city specifications. At South Coast Hauling & Bobcat, we always follow all applicable building and safety codes. Whether you need a sewer and water tie-in or a cable line replaced, call South Coast Hauling & Bobcat for a free over-the-phone or on-site quote. 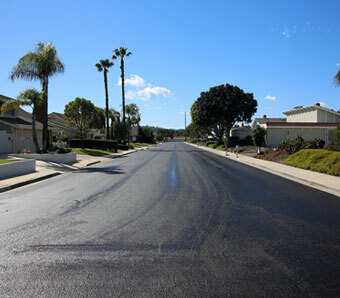 We welcome underground utility jobs of all sizes anywhere in Orange County. By following the industry's best practices and taking great care in everything we do, we make sure that every job is done right and completed on time.